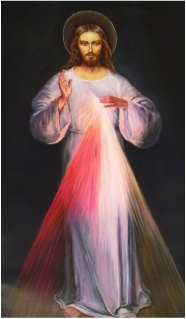 Veneration of the Image of "The Divine Mercy"
In Poland on February 22, 1931 Jesus appeared to St. Faustina dressed in a white garment as the Risen Christ with the scars of the crucifixion on His hands, feet, and side. He appeared in this way because it is in the Passion, Death and Resurrection of Christ that we have the fullness of Divine Mercy revealed to us. For this reason this image is called: “The Divine Mercy.” In the Divine Mercy Image everything has a spiritual meaning. Jesus is opening His robe with his left hand, but we do not see His heart. We see that from His pierced side two beautiful rays of light issue forth: a pale and a red ray. He is reminding us of the treasures that He has given us in the Catholic Church through the Sacraments. Jesus has His hand raised giving a blessing. Jesus has died for us. He has shed his very last drop of blood for us. Now we must do the same in service to our neighbor. Jesus tells St. Faustina, "It is to be a reminder of the demands of My mercy, because even the strongest faith is of no avail without works.” (Diary, 742) He says, "I demand from you deeds of mercy, which are to arise out of love for Me. You are to show mercy to your neighbors always and everywhere." (Diary, 742) We are to be people of mercy always and everywhere by the deeds we do, by the words we say, and by our prayers. Everything about us is to reflect His goodness, because on the Day of Judgment we will be judged according to the good works we show now. 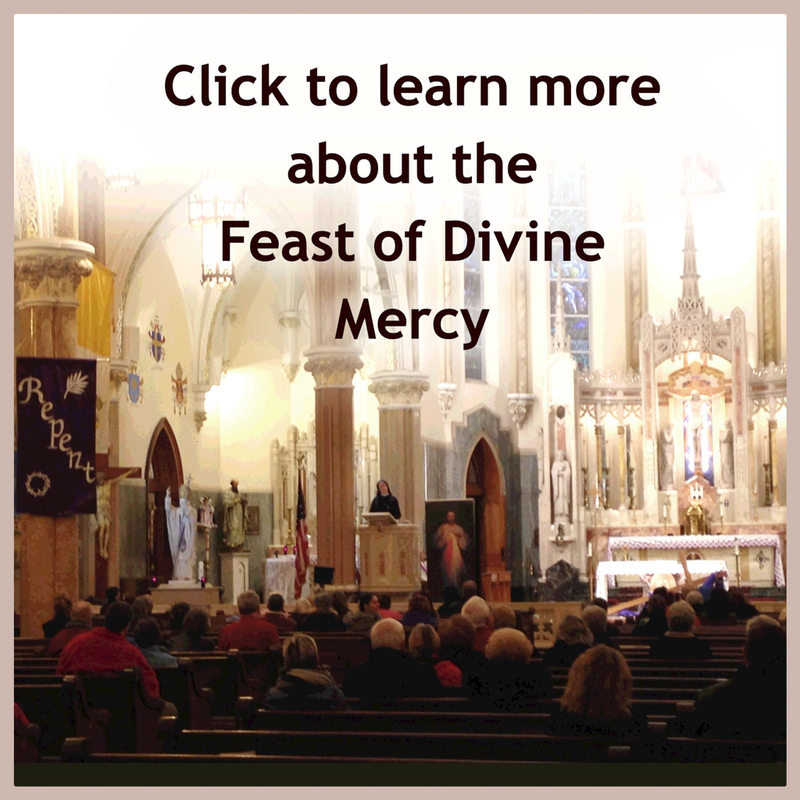 The Catholic Church teaches us seven works of mercy pertaining to the body and seven pertaining to the soul. We call them the corporal and spiritual works of mercy. The corporal works of mercy are to: feed the hungry, give drink to the thirsty, clothe the naked, shelter the homeless, visit those in prison (ransom the captive), comfort the sick, and bury the dead. The spiritual works of mercy are to: admonish sinners, instruct the uninformed, counsel the doubtful, comfort the sorrowful, bear wrongs patiently, forgive offenses, pray for the living and the dead.